Apparently some years the trees just don’t bear a good crop and the following year there will be a bumper harvest. 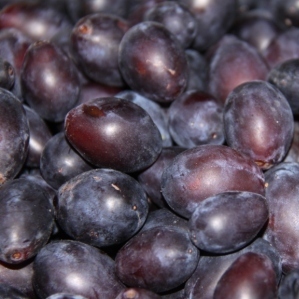 Luckily farm shops have plenty of damsons for sale for £1.50 or £2 per kilo. This is one of the easiest and most delicious treats you can make. Have a go! You’ll need damsons, sugar and gin. Clean the jars by filling with boiling water then tip it out and allow jars to cool whilst you prepare the fruit. Remove any stalks and wash the fruit in a colander under the tap. Prick the damsons with a fork. Fill an airtight jar with pricked ripe damsons, add sugar and pour in gin. That’s it. I used 2 kilos of damsons, a litre of gin and 750g of golden caster sugar. That was sufficient for two jars, one 2.3 litre and the smaller one just 1 litre. Place the jars in a cool dark cupboard and turn upside down daily to dissolve the sugar. 8 weeks later decant liquid into empty gin bottles. It’s ready to drink immediately. You can either drink it like a liqueur (in small glasses – it’s very strong) or add it to champagne for a luscious cocktail.